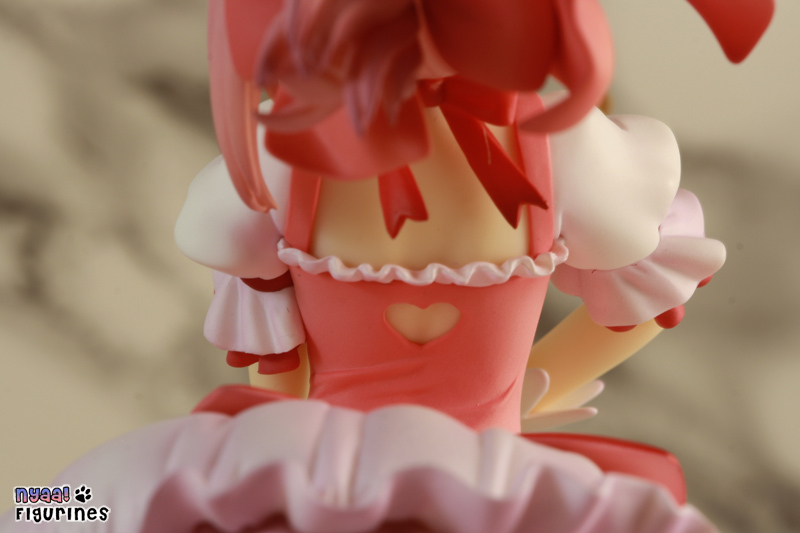 I must admit that I wish we could start doing figurine reviews on a weekly basis again… This might actually happen in the future after we finish our Japan trip at the end of this year… But we will honestly be saving money to actually (hopefully) move to Japan for 6 months or 1 year. If any of you guys have followed us long enough, then the answer to the unasked question is: Yes, we do plan on doing another blog when we go. It will be for 3 weeks this time. 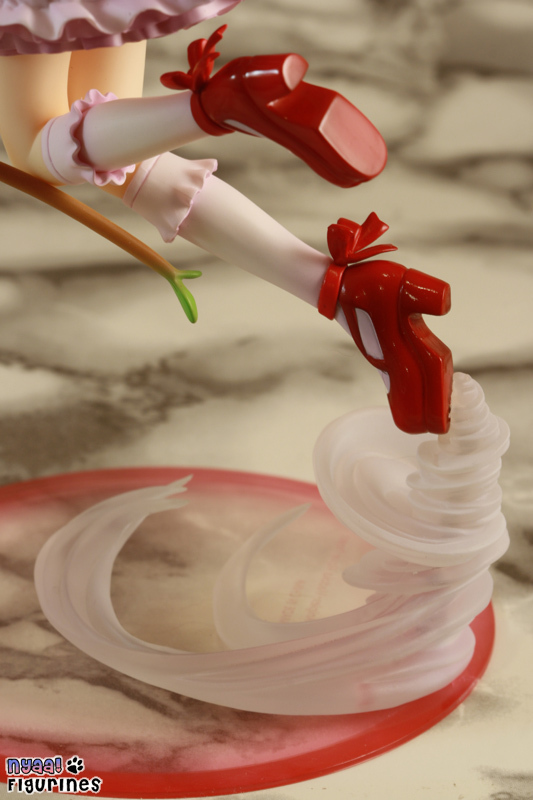 However, enough about that; we’re going to take a look at a figurine that we thought long and hard about. 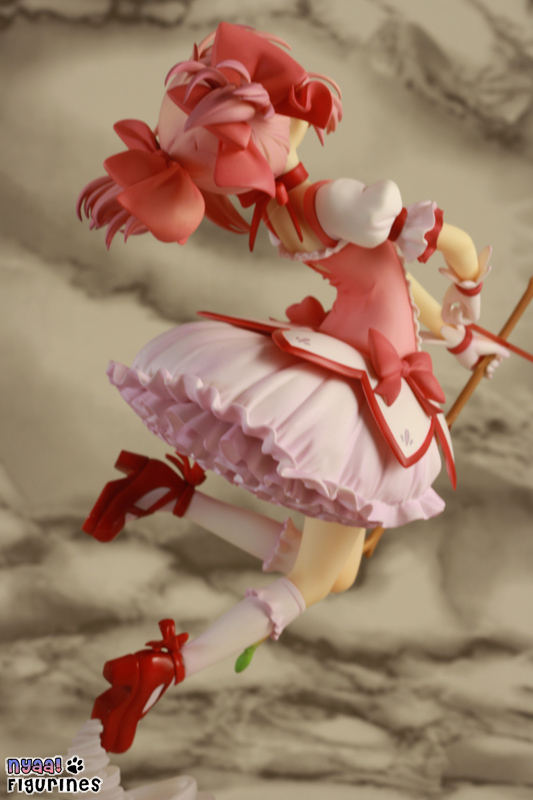 Long enough that we missed the first chance to purchase it, but when we saw that it had come back in stock again and that we had very few figurines that month, we decided to jump onto it. One of the things that I personally look for in a figurine is a lifelike pose, or a “sense”, if you will. That is what struck me about this figurine when we saw it online. Just the way she looked in her pose with this natural, drifting forward look to her… it looked so real. 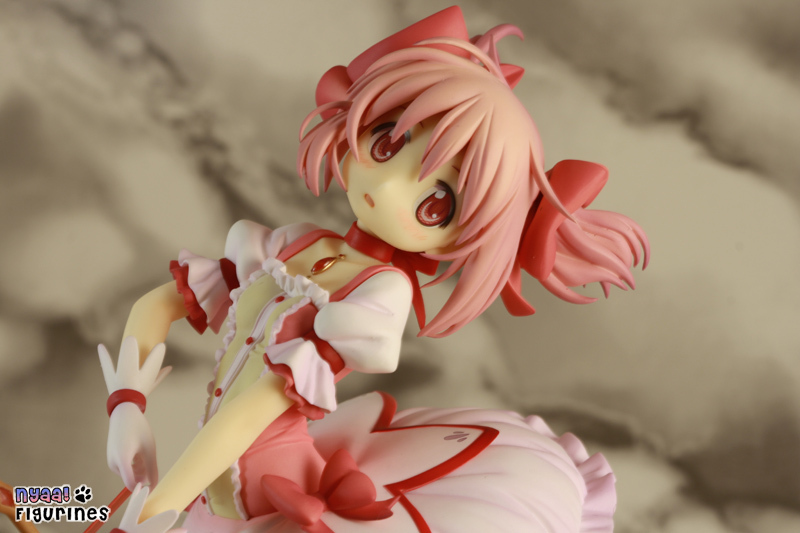 The pose really makes this figurine for me, even looking at it right now it kind of gives me a melancholy feel from the look on her face… It kind of makes me wish that I had watched the anime to see if there was some relevance to it. The dress itself is done really well. I love looking at it. Even on display I sometimes find myself walking past it and stopping just to give it another look. I love the way it’s all floofy and such underneath. It’s simple, yet at the same time slightly complex just with the detail inside of it. It really helps that they totally nailed it. There are no signs of a mar or color bleed on it anywhere, and all of the decals are flawless as well. 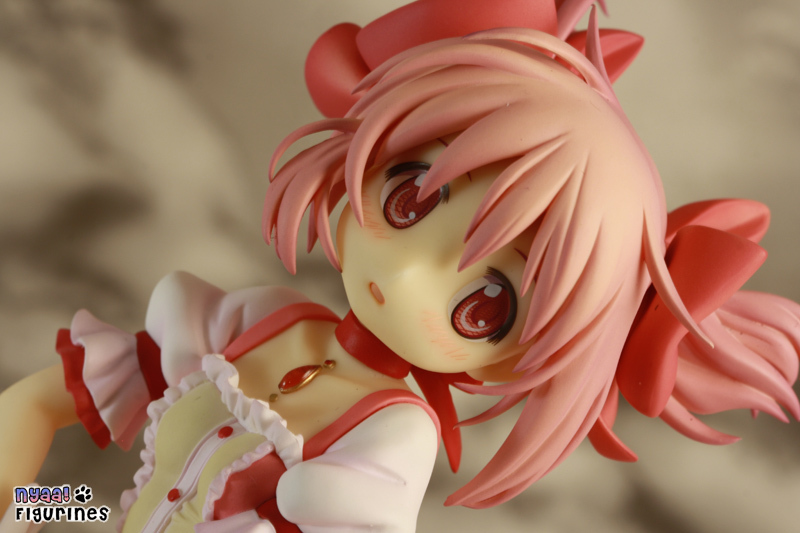 There’s something about the look on her face as well… the head shape and eyes are done perfectly from what I HAVE seen of the anime, and I can really appreciate that. It would seem more minor, but realistically given the size of their eyes in the anime it would really kill it if they messed up the proportions. 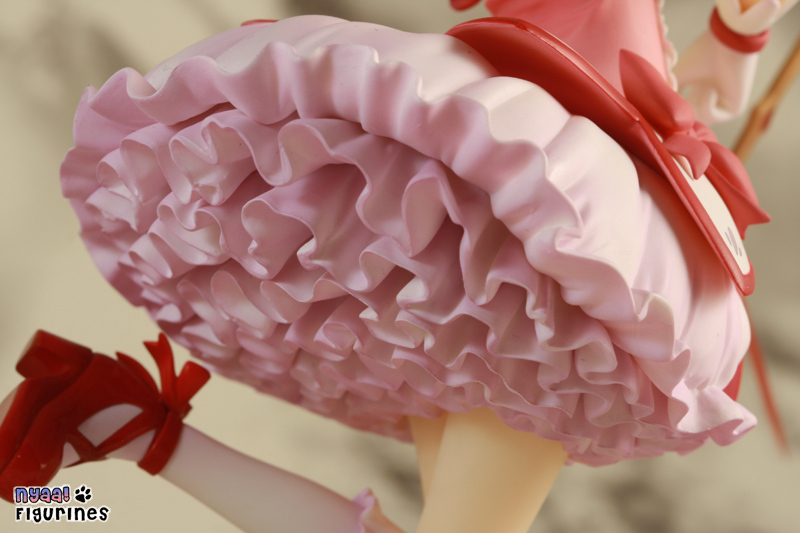 The hair as well has a great flow to it, I love the bows on it, and I can really appreciate how it adds to the flow of the figurine with the forwards movement aspect. I really like how the girl herself is dainty, but the dress is huge… it’s pretty awesome. There are a few things on this figurine that really bother the hell out of me, though. The first one is her arrow, and honestly it was the exact same thing for the large one we had as well. 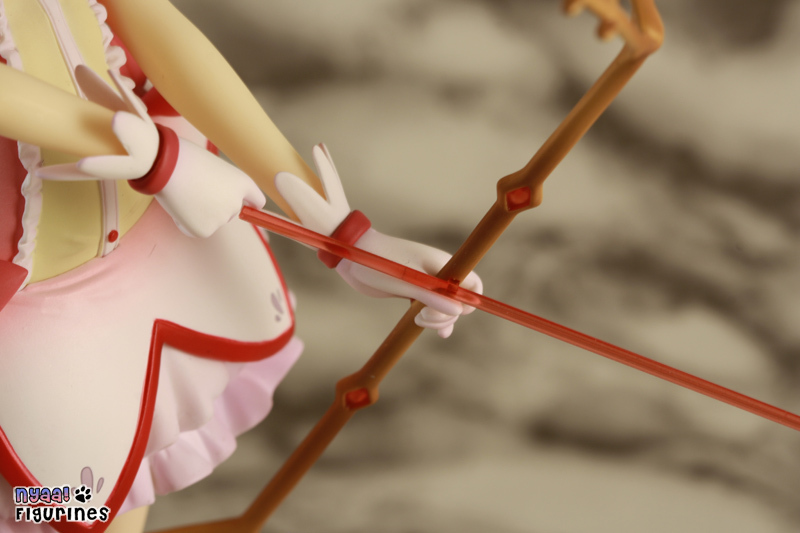 That damn arrow, if you even blow lightly on the figurine it falls off….. OK, that’s an over-exaggeration, but I really do wish they would’ve done a better job there. Secondly, the base… while the base is cool and semitransparent so that you don’t really LOOK at it, but focus more on the swirl of air… the connection to said air swirl is good for a side to side movement, but not to an up and down motion. The way the peg goes in means that it’s almost impossible for her to fall out, but this does cause her center of gravity to have a gangster lean. 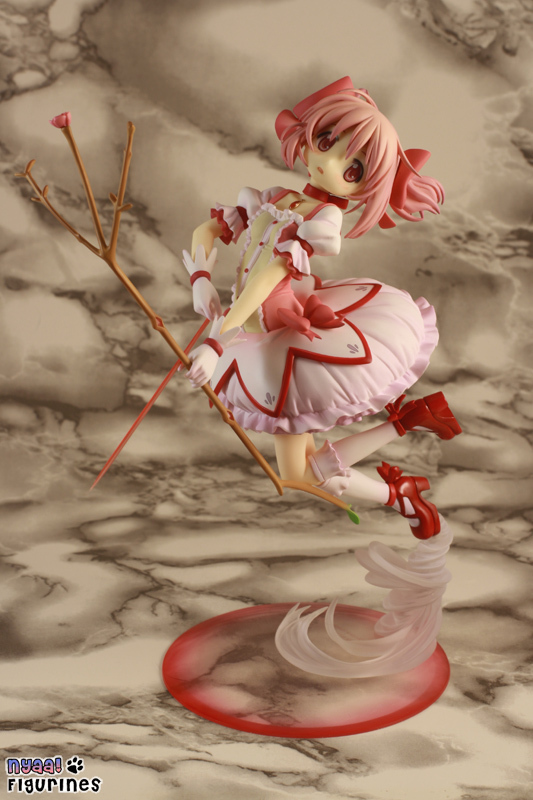 This is most definitely a figurine we will have to store away after having it out for a while. All in all, I am glad that we got this figurine… I do realize that I say that for almost every single god-damn review that I do, but this figurine really was one that we took a pass on and then changed our minds. Any serious collector knows that when you take a pass on reserving a figurine, you really don’t get a second chance unless you purchase second hand. It does make me wish that we had more from this series, like the other girls so that we could dedicate a shelf to them as it does appear that they deserve it. However, barring our trip to Japan and picking some up then, I do not foresee any in the future unless they’re new. Well, that’s going to be it for this week. As usual, I leave you with an AMV. This one is One Piece and does contain spoilers for anyone who is not up to date on the ANIME… no manga spoilers.